Car accidents happen. Odds are most people will be in at least one car crash at some point. Luckily, most crashes aren’t life-changing events. But some are, and when it’s your time to be involved in a crash, you never know when it will truly change the course of your life. As Kansas City personal injury lawyers, we have experience helping clients with car accident claims in both Missouri and Kansas. The law requires drivers to buy certain types of insurance in order to be allowed to drive a motor vehicle. If you do not follow the law regarding so-called “financial responsibility,” you cannot legally drive a motor vehicle. But what does “financial responsibility” mean? In both Missouri and Kansas drivers are required to buy certain types of insurance with certain levels of minimum coverage. The first type of required coverage is referred to as liability insurance coverage. This type of insurance applies when a driver causes an accident and injures someone else. In both Missouri and Kansas the minimum required amount of liability insurance coverage is $25,000 per person for bodily injury and $50,000 per accident for bodily injury. What this means is if a driver who has the minimum level of insurance causes an accident, the most any injured person can recover from that at-fault driver’s insurance policy is $25,000. If two people are seriously injured, each of them could potentially receive $25,000. If three people are seriously injured in the accident, they would have to share the $50,000 coverage maximum (with none of them receiving more than $25,000). What happens if someone is seriously injured in a car accident caused by a driver with only the minimum required coverage? Or even worse, what happens if the driver failed to have any liability insurance? In many instances, the story does not have a happy ending. And if there is no one else to blame for the actions of the careless driver (such as their employer if they are on company time when the accident occurred), the seriously injured person is usually left with little or no compensation. Unfortunately, we have had to so advise many clients over the years and it is heart-wrenching for people in that situation. There is another type of coverage that can apply to this scenario. It’s called uninsured motorist and underinsured motorist coverage. You buy liability insurance to protect someone you might carelessly injure, who will look to the liability coverage in your policy to be compensated for their injuries. In contrast, you buy uninsured/underinsured coverage to protect yourself from being injured by another driver. With uninsured/underinsured coverage, you will look to your own insurance company to compensate you for your injuries that were caused by someone else. In Missouri a driver is required to buy uninsured motorist coverage but is not required to buy underinsured motorist coverage. The minimum uninsured motorist coverage required in Missouri is $25,000 per person and $50,000 per accident. Drivers in Kansas are required to buy both uninsured and underinsured – the minimum amounts required are $25,000 per person and $50,000 per accident. These types of coverage are similar but they are not the same. Uninsured motorist coverage (referred to as UM) applies when the person who injured you did not have any liability coverage. In that instance, you look to your insurance company and the UM coverage in your own policy to compensate you for your losses. Underinsured motorist coverage (UIM) applies when the person who injured you had some liability coverage but did not have enough coverage to fully compensate you for your injuries. If you have UIM coverage, your insurance company will make up the difference between the compensation you received from the careless driver and the amount of your losses. What does all this mean and how much insurance coverage do most people need? You may think all you need to do is comply with the minimum financial responsibility requirements and buy a liability policy providing coverage of only $25,000 per person and $50,000 per accident. After all, doing so makes you “street legal” and as long as you’re following the law. Why buy more coverage than you are required to have? Here’s why: If you are on your way to the grocery store and glance at your phone and run a red light and seriously injure someone, the person you injured can (and likely will) sue you. They do not sue your insurance company. Assuming you are current and haven’t allowed your insurance policy to lapse, your insurance company will provide a lawyer to defend you and may make an offer to settle the case within the policy limits of your insurance policy. However, if you bought only a minimum policy, and if the person you injured requires more than $25,000 to be compensated, all of your assets are now potentially at risk. The person who has been injured isn’t obligated to settle for your minimal insurance policy and can instead obtain a judgment against you for an amount far higher than your insurance coverage. On the other hand, if you had more coverage than just the minimum amount, there is a much greater likelihood that the person you injured would be fairly compensated from your insurance coverage due to the higher liability coverage amount. So even though most people don’t realize it, they are not only buying liability insurance to protect someone they might carelessly injure, but they are also buying it to protect themselves from getting hit with a large judgment, jeopardizing their assets and their financial future. It is wise to buy enough insurance to ensure that if you make a mistake, you won’t pay for it for the rest of your financial life. Many people buy coverage of $100,000 per person and $300,000 per accident, and some people buy coverage of $300,000/$500,000, or even more. Likewise, to keep from placing yourself at the mercy of others who may make a careless driving mistake – someone who may have minimal or no liability insurance – it’s a good idea to have uninsured and underinsured coverage. As with liability coverage, the amount of UM/UIM coverage people buy varies but many people buy coverage of at least $100,000/$300,000. If you’re afraid you might not have enough insurance — liability and uninsured/underinsured — you can call your insurance agent and increase your coverage. If you have questions about this, give us a call and we would be happy to help you. 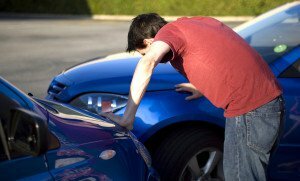 Having the proper insurance is critical for protecting yourself, no matter who is at fault in an accident. However, if you are injured by another driver, their insurance company will try to minimize your compensation. It’s important to have good counsel to ensure your family is taken care of. Take a look at our experience with personal injury and car accident lawsuits in Kansas and Missouri and give us a call if you have any questions.